Metronet Integration, Inc. is built on a strong foundation of commitment, creativity, clear focus and high ethics. Metronet has been integrating sophisticated electronics into business and home environments since 1981. With over five decades combined experience in upscale home and business electronics, our designers are dedicated to understanding our customers needs and making technology work for them. 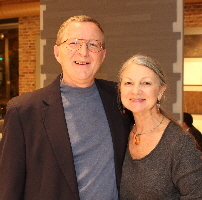 Founders Gillian & Jack Schultz started their first company, Gem Security Consultants, Ltd., in 1981 with a focus on security for high risk businesses including the diamond and jewelry industries, credit unions, museums, furriers and galleries. They offered high security safes, camera surveillance and access control. In 1983, prompted by client demand for high quality alarm systems, the partners founded Metronet Installations, Inc., dba Metronet Safe & Sound. Over a period of twenty years, the companies grew dramatically into one of the most highly respected companies of its kind, with a strong niche serving the security and communication needs of the entire jewelry industry. By partnering with each client, Metronet provided customized service specifically tailored to their individual needs. In 2007, in order to focus on the highly specialized field of integrated system design and provide the very best results for their clients, the partners sold their security interests to Sentry Security Inc. and founded Metronet Integration, Inc. The company no longer operates under the name of Metronet Safe & Sound. Metronet Integration continues to gain recognition by individuals, corporations and institutions who are seeking top quality systems and service. Our strength is in designing high performance systems that combine the most sophisticated technology available with user-friendly control. Metronet is a licensed electrical contractor and a long term member of CEDIA (Custom Electronic Design & Installation Association). All installations are carried out by our CEDIA trained and certified staff of technicians and we provide courteous, on-call emergency service 24 hour per day. Member -Custom Electronic Design & Installation Association. A CEDIA member is part of a select group of proven experts who are committed to a higher standard of education. Hiring a CEDIA Certified Professional gives you peace of mind and the finest in custom electronic design and installation. You deserve nothing less. This certification provides you with peace of mind.